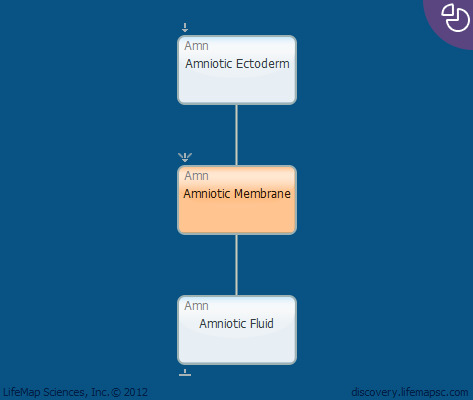 The amnion is a bilayered membranous sac which surrounds and protects the embryo, enclosing the amniotic cavity (amnion). It is the first among the three embryonic cavities (amnion, chorion and yolk sac) to develop. The amniotic cavity is roofed in by the amniotic ectoderm, comprised of a single stratum of flattened, ectodermal cells, and its floor consists of the prismatic ectoderm of the embryonic disc. The amniotic ectoderm is covered by a thin layer of mesoderm, which is continuous with that of the somatopleure and is connected, via the body-stalk, to the mesodermal lining of the chorion. The somatopleure, which is a combination of ectoderm and mesoderm, gives rise to both the amniotic and chorionic membranes; the ectodermal tissue supplies functioning epithelial cells, and the mesoderm generates the essential blood supply to and from this epithelium. The amniotic membrane forms as a layer of epiblast cells expands towards the embryonic pole and differentiates into a thin membrane that separates the new cavity from the cytotrophoblast and eventually constitutes the lining of the amnion (appears on day 8 of human development). The amniotic fold is formed when the somatopleure folds upward and at the point of constriction where the primitive digestive tube of the embryo joins the yolk sac, the fold tips meet and fuse over the dorsal aspect of the embryo, forming the amniotic cavity. The two layers of the fold then become completely separated, the inner forming the amnion, the outer the false amnion or serosa. The space between the amnion and the serosa constitutes the extra-embryonic coelom. When first formed, the amnion is in contact with the body of the embryo, but about the fourth or fifth week of gestation, amnionic (amniotic) fluid (liquor amnii) begins to accumulate within it. This fluid increases in quantity and causes the amnion to expand and to ultimately adhere to the inner surface of the chorion. The liquor amnii increases in quantity allowing free movements of the fetus during the later stages of pregnancy, and protects it by diminishing the risk of injury.